An interesting shift is taking place amongst Spanish wine drinkers in the USA. White wines are growing in popularity relative to the more traditionally recognized Spanish reds. Not long ago we had trouble convincing people to try white wines from Spain. Now, the choices are numerous, the quality is high and the prices are quite reasonable. The Albariños from Galicia were the first Spanish whites to really take off in the American market, followed by Rueda region Verdejo wines. Then a few years ago it was as if the grape cart tipped over and out spilled Godello from Valdeorras, Viura from Rioja, Garnacha Blanca from Priorat, Treixadura from Ribeiro and Hondarribi Zuri from the Basque country. With so many distinct, vibrant, interesting styles to choose from, Spanish whites have become an adventure in novelty grounded in traditions that are only now starting to find an audience outside their native regions. Odysseus Pedro Ximénez Blanco 2007This is a unique dry white wine in that Pedro Ximénez is usually reserved for use in sweet Sherry, while this, on the other hand, is totally dry and has notes of apricot, tangerine, a bit of lemon and white flowers. Bright acidity and foundational minerality find balance in the rich, leesy texture and floral aroma. We paired this with first-of-season Dungeness crab (simply steamed) the other night. It worked perfectly. Regular retail $35.99. Now $19.99-Limited. A long time importer friend of the Spanish Table here in California has called it quits and moved to Australia. He’s given us first pick of his wines at amazing prices and we stocked up on a few choice items. These hearty reds are cellar worthy selections that will be available only while the limited supply lasts. Enjoy them tonight after a bit of breathing time (they respond amazingly well to a bit of air) or put them away for down the line. This is definitely a not to be missed opportunity. 2004 Valduero Crianza – Valduero is one of the older wineries in Ribera del Duero and continues to make a more traditional styled Crianza, Reserva and Gran Reserva. We’ve bought the last 30 cases of the 2004 Crianza and for good reason. Floral blackberry, smoke and star anise and a touch of pepper on the nose. Rich and full flavored with sweet black cherry, chocolate, and cinnamon. Lasting flavors of baking spice, black fruit and good acidity on the finish. This is still young and will drink well for the next couple of years easily. 2004 Sangenis I Vaque Vall Por Priorat – Sangenis I Vaque was founded back in the late 70’s but the vineyards have been in the Vaque family since the 1700’s. Their vineyards, which are organically farmed are located around the town of Porrera and are primarily the famed black slate (licorella) that has made Priorat famous. A stellar vintage, this is tightly wound and a decant makes this shine. Spicy blueberry, chocolate and plumcake on the nose. Velvety & silky with dense, palate coating flavors of dark chocolate, plum and blueberry, anise and a mineral edge. Bright acidity and lingering notes of mineral and sweet blueberries on the finish. Joseph Puig is the man behind the Priorat winery called Bodegas Ithaca. Puig is an avid inventor and is well-known throughout Spain for his numerous patents (the cantilevered cork screw, for instance) as well as his fascination with the tale of Odysseus. His wines in have always done well at the Spanish Table but due to a change of Importers (same story as Valduero in the adjacent column) Bodegas Ithaca has been in short supply. A new importer has started bringing in new vintages. Meanwhile, here are some choices from previous vintages that will disappear quickly at these prices. 2006 Penelope Garnatxa Blanca – This is the other option, but done with the white grape. Again just slightly sweet, this leans towards honey and white peach, apricot blossoms, a touch of mint and good minerality. Round and full on the palate. 500ml bottle. Regular retail $34.99. Now $18.99 Limited. 2007 Odysseus Pedro Ximenez Blanco – This is a unique dry white wine in that Pedro Ximenez is most often found raisined and pressed to make an extremely sweet Sherry. This is totally dry and has notes of apricot, tangerine, a bit of lemon and white flowers. Good minerality and good acidity. Only 150 cases made. Regular retail $35.99. Now $19.99 Limited. Welcome back to our continuing Spanish wine round up. This week the glory that is Spanish regionalism is in full effect as we hopscotch around this diverse land tasting wines of all types and styles. This week the ever changing selection of new vino at The Spanish Table includes some traditional and familiar names, but also several white and red wines from parts of Spain that are only recently getting their fair share of attention. Each of these wines express the character and style of their respective regions. Read on to discover a half dozen uniquely delicious wines that will compliment your meals, excite your intellect and inspire your imagination. 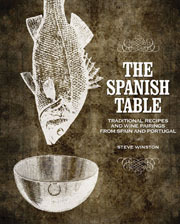 Steve Winston is coming down from our flagship store in Seattle to make paella and sign copies of his new book. This is your chance to meet the man who started The Spanish Table and chat with him about all things related to the culinary traditions of Spain and Portugal. Steve is a veritable treasure trove of food and wine esoterica. He has accumulated much of this knowledge in his new cook book. Stop in on Sunday August 9th at 1 pm (or Saturday August 8th in Mill Valley) to quiz him on what (and where) to eat in Spain and Portugal. While you are here you can sample his famous Paella and pick up a signed copy of The Spanish Table Cookbook. Are you planning on watching football on Sunday? If so, what will you be drinking? You know where I’m going with this, right? I’m about to suggest some new and interesting wines to pair with a traditional Superbowl Sunday menu, but if football is not your thing (hey, that’s OK) keep reading anyway because these new arrivals are worth knowing about and trying even without any official justification. This week we have a trio of new wines from Chile made by Bodegas Montes. The Sauvignon Blanc, the Pinot Noir and the Cabernet Sauvignon/Carmenère blend will all compliment a wide variety of party foods, from chips and dip to chicken wings as well as more traditional accompaniments like fresh ceviche or dry cured chorizo. Montes also makes wine in Argentina under the Kaiken brand. We have the new Kaiken Malbec this week for all you Malbec fans out there (which seems to include pretty much all of us). Speaking of Malbec, we have another new one to try, this time from the well known Achaval Ferrer winery. Their 2006 Malbec is a top shelf selection at a very reasonable price. If meat is on the menu this weekend then by all means pour this wine with the meal to taste it at its best. Meanwhile, back in Spain new vintages are being shipped our way. The latest arrival here is the 2003 vintage of one of my favorite Priorat wines, Odysseus Tinto. The news here is very good indeed. Not only is this an excellent wine but the 2003 is actually a bit lower in price than the previous vintage (how often do you hear that these days?). Finally, if your Sunday plans mandate beer rather than wine, I understand. Old habits are hard to change and that’s fine because you can still add an Iberian twist to your beer appreciation. We have excellent Spanish, Brazilian and Portuguese Lagars as well Portuguese Bock and Argentine micro brewery Ale, already chilled and ready to enjoy. Now, before we move on to the wines, I have a few event notes to share with you. My Paella And Wine class on Feb. 25 is still open for enrollment. Check out kitchenonfire.com for all the details. Montes Limited Selection Sauvignon Blanc 2007 $13.99 This crisp, refreshing white wine from the Leyda valley in Chile is ripe with tropical fruit aroma. Bright, citrusy acidity and a bit of grassy background flavor make this an excellent cocktail wine. Serve this with celery sticks and blue cheese dressing, and okay, a few chicken wings too. Racy, refreshing, remarkable. Montes Limited Selection Pinot Noir 2006 $13.99 This Pinot Noir, made in small quantities from fruit grown in the Leyda Valley as well as the Casablanca region of Chile shows bright cherry color and fresh berry fruit character right up front. The light oak note comes from eight months of barrel age and becomes more apparent as the wine opens. If you think that all Chilean wines are big and bold, this lighter style may surprise you in the best of ways. Chips and salsa will go great with this wine. Montes Limited Selection Cabernet Sauvignon/Carmenère 2006 $13.99 This wine is a good example of how, when done right, Chilean Carmenère can be distinctly spicy and rich. The winemakers at Montes blend this traditional grape with a large proportion of Cabernet Sauvignon to achieve a structured complexity that compliments the peppery Carmenère. The fruit comes from the Apalta Valley, one of Chile’s best grape growing regions. Serve this wine with spicy pork ribs or carnitas tacos for a bold and hearty game day treat. Kaiken Malbec 2004 $11.99 Kaiken is a Mapuche word for a particular Snow Goose that migrates across the Andes between Chile and Patagonia, just as Bodegas Montes has crossed the mountains to start making wine in the Mendoza region of Argentina. This dark, rich red wine is 100% Malbec from the prestigious Lujan de Cuyo region of Mendoza. Inky dark purple color and concentrated sweet fruit aroma. Ripe berry and spicy pepper flavors will compliment grilled meats and any food that is at last a little bit picante. Achaval Ferrer Malbec 2006 $22.99 This young winery was founded in 1998 but has achieved great success in a short period of time. This wine, the entry level product for the winery, is 100% Malbec from the high altitude Vistalba region. Obvious care has been taken to produce a rich and opulent wine that still retains a certain level of finesse and detail. The ripe berry fruit character balances foundational minerality which, in turn, compliments a bit of spicy/herby background aroma. This is beef wine, from burgers to porterhouse steak. There is really no other option, but would you want it any other way? Odysseus Tinto 2003 $41.99 Wines from the Priorat region in Catalunya have gotten pretty pricy of late, so I am very happy to offer this new version of one of our favorite small production Priorat reds at a better than usual price. Composed of a blend of 35% Garnacha, 35% Cariñena and 20% Cabernet Sauvignon with the last 10% composed of Touriga Nacional, Petit Verdot, Syrah and Caladoc, this unique and intriguing wine offers abundant pleasure for those know to ask for it. This is a plush wine that exhibits dark color, ripe fruit character and that distinctive mineral element that makes Priorat wines so interesting. If you want a big red for the big game, this is it. Cerveza Estrella Galicia $10.99 (6 pack) Fresh, hoppy lagar from the north of Spain. Cerveja Sagres $6.99 (6 pack) Another tasty lagar, this time coming from Portugal. Super Bock $7.99 (6 pack) A strong beer (technically, malt liquor) from Portugal. Hearty! Cerveja Skol $7.99 (6 pack) One of Brazil’s most popular beers. This lagar will remind you of Rio. Jerome Cerveza Rubia $5.99 (660ml. bottle) The first micro brewery in Argentina makes this Belgian style ale in Mendoza. Hoppy and rich, this proves that Mendoza is good for more than just wine. By now, unless you are like me, you have probably taken care of your major holiday responsibilities. The office party is over and done with, the big holiday meal is in process and the gift shopping is winding down. Nevertheless, something will come up, as it always does, leading you to need one more small gift (or a few) to satisfy last minute situations. Secret Santa, stocking stuffer, hostess gift, call it what you will, sometimes the small gesture speaks louder than the grandiose one. Quinta dos Grilos 2004 $10.99 (375ml) Grilo is Portuguese for cricket, and while you won’t find any crickets in this wine, the flavor may remind you of a warm summer night in the back yard, grilling something tasty, swatting mosquitoes and listening to the (you guessed it) crickets. From the Dao region of Portugal, this wine is bright and savory, with cherry-like fruit overlaying a tannic core. Chirp! Muga Reserva 2003 $13.99 (375ml) Muga Reserva, one of the most celebrated wines from Rioja is just as tasty in the small bottle as it is in the big one. Dark color, loamy aroma and rich elegant fruit character are what one looks for in a wine such as this. You will not be disappointed. Arzuaga Crianza 2004 $15.99 (375ml) The Ribera del Duero region is known for bold, earthy red wines. Bodegas Arzuaga makes exactly this style of wine. Dark color, smoky/oaky tannins and rich multi-layered fruit character. In the sprit of all things tiny, serve this wine with a traditional Ribera del Duero meal of tiny, thin cut lamb chops quickly grilled over vine cuttings. Muy tipico. “Small is beautiful”, the motto of Viñedos Ithaca, is reflected in many ways. Viñedos Ithaca sits on a small 50-acre property of steep hillside vineyards near the little village of Gratallops. The wines they make are all produced in limited (almost miniscule) quantities. The flagship wine is the red Odysseus (the Puig family is much enamored with Greek mythology), a wine that has garnered many awards and much accolade in the few years since its creation. Additionally, they make several unique and distinctive white wines as well as a stunning rosado. As if that were not enough, Viñedos Ithaca also produces not one but two spectacular late harvest dessert wines, one white and one red. Odysseus Garnacha Blanca is a rare white Priorat wine made from native Garnacha Blanca grape. Notes of peach, pear, and honeysuckle on the nose with a long, silky finish and great complexity in the mouth. Great personality crafted in an original style. The wine was carefully fermented in the “old-style” without temperature control and a unique maceration within the French oak barrel for 8 hours. Limited production of 400 cases. Odysseus PX is made from Pedro Ximénez, best known as a sweet sherry grape. After discovering a parcel of old vine PX within their vineyards Josep and Sylvia decided to vinify the PX separately. The final result is a unique rich, dry white wine and the only still wine made from PX grapes in Spain. Apricots, peaches, nectarines and green apple find room in the nose with additional highlights of roses. Higher toned than the Garnacha Blanca showcasing abundant bright fruit a wonderful mouth feel and a finish of golden raisins. Limited production of 150 cases. Penélope Garnacha Blanca is a totally natural sweet wine using hand selected late harvest Garnacha Blanca fruit from the oldest vineyards near Scala Dei. Aromas of white peach, wet stone, jasmine and honeysuckle with a touch of mint and melon. On the palate it is slight meaty and creamy with juicy stone fruit flavors. Pure, clean and round. 250 500-ml. bottles produced (yes, bottles, not cases). Penélope Garnacha Peluda is fashioned from late harvest Garnacha Peluda (the same grape is picked earlier for the Odysseus Tinto) fermented with minimal manipulation. Opaque garnet color. Spicy clove and dried fig aromas. Gentle and balanced sweetness with flavors of pomegranate and cranberry. Distinctly different style of sweet wine. Miniscule quantities produced. Maestro Sierra was founded in 1832 by Jose Antonio Sierra, who, as a master carpenter, was responsible for building barrels for all the major Sherry bodegas. Recognized as one of the top coopers in the area, he longed to become involved in the Sherry trade itself. As this business was dominated by the nobility, a start-up such as his was not very welcome. After many hardships he was able to establish and grow his business becoming one of the top Almacenistas (stockholders) of high quality Jerez wines. Poking fun at his struggle, the label depicts an allegorical fox hunt with the “Nobles” hunting the fox (Maestro Sierra). Pilar Pla Pechovierto currently owns Maestro Sierra. Doña Pilar is a widow whose husband was a direct descendent of the Sierra family. She respected her husband’s wish that the winery remain in operation after his death and over the last thirty years she has kept the winery open, selling very limited stocks of wine to a few of the large bodegas. Because the wines have virtually remained unmoved due to the almost non existent business, the stocks at Maestro Sierra are some of the oldest in Jerez. The soleras at the winery are easily over 60 years old and some maybe close to 100 years old. Maestro Sierra Amontillado is amber gold in color with a rich aroma of almonds and fresh hay. A very gentle note of raisin-like fruit character is present here. This wine pairs well with aged cheeses and cured meats. The Maestro Sierra Oloroso is dark amber with flavors of walnuts, butterscotch and figs. Serve this wine in a small glass to your special someone, after a big meal, on the bear skin rug, next to the roaring fire, etcetera, etcetera, etcetera. We are very excited to announce the arrival, just in time for Thanksgiving, of some spectacular new wines from the tiny Ribeira Sacra region in northwestern Spain. De Maison Selections, the same intrepid importers who bring in many of our favorite Basque Txakoli wines, have been very successful at finding lesser known Spanish regions that produce unique and delicious wines. Andre Tamers, the President of De Maison Selections has this to say about their newest project. “One of the most stunning landscapes in Spain is located in the heart of Galicia in an area known as the Ribeira Sacra (Sacred Banks). Driving on the N-120 between Vilafranca del Bierzo and Orense you follow the river Sil as it cuts through gorgeous canyons terraced with vineyards. D. Ventura is a new project by Ramon Losada and his family utilizing old family holdings in this ancient wine growing region. Ever since the Romans inhabited the area, people have been growing grapes on the steep terraces bordering these two rivers. Working these lands is extremely difficult as the terraces in some areas are so steep that all the grapes have to be brought in on a hoist. In addition to an organic approach to farming, winemaking has also changed. Only indigenous yeast is used to start fermentation. None of the wines are filtered or cold stabilized. Lastly, the maturation of the grapes is watched carefully to insure that the grapes are fully mature when harvested. I am particularly happy to receive these wines right now because they are, I feel, particularly appropriate for Thanksgiving. These are medium bodied wines with no oaky overtones to mask the vibrant fruit character and the fine minerality of these low alcohol (12.5%, also a good thing this time of year!) wines. Any of them would be a perfect match with turkey, dressing and the rest of a traditional Thanksgiving meal. Additionally, we also have some white, rosado and sparkling wines that have been well received in past years and are back again to add a bit of lively Spanish character to your Thanksgiving table. Avinyo Vi D’Agulla 2006 $12.99 This lightly effervescent white wine made from Petit Grain Muscat is floral and aromatic like a Moscatel, but only gently sweet. The light bubbles lift the scent and give the wine a lively, fresh character. The prickly effervescence is what gives the wine its name. Serve Vi D’Agulla as a welcoming cocktail to your dinner guests and watch the smiles spread with each sip. Reymos Espumoso de Moscatel $11.99 Sweet sparkling wine from D.O. Valencia. Rich Muscat grape scent, honeydew melon fruit character and light but persistent bubbles. A mere 7.5% alcohol makes this the perfect end-of-meal wine. Serve alongside a slice of your favorite pumpkin pie. Valduero Rosado 2006 $14.99 If you can’t choose between serving red or white, here is your solution. This unique rosado is made in the Ribera del Duero region from Tempranillo grapes. This dark, spicy rosado will compliment rich, sauced dishes such as salmon in a pastry crust or turkey and gravy. Odysseus Rosado 2006 $23.99 Composed primarily of the same Garnacha grapes that go into the Odysseus Tinto, plus smaller amounts of Cabernet Sauvignon, Cariñena and Touriga Nacional (a traditional Portuguese variety), the 2006 is the darkest and ripest Odysseus Rosado so far. Fresh berry fruit character is rich and mouth-filling, balanced by moderate acidity. Not a light back porch rosado, this wine calls out for candied yams, cranberry sauce and creamed pearl onions. D. Ventura Viña do Burato 2006 $16.99 Composed of 100% old vine Mencía from D. Ventura’s Minho River property, this light red is fresh and youthful with the dried leaf aroma that is typical of Mencía. This is the leanest of the D. Ventura wines. This unoaked red will compliment fresh vegetables, poultry, rice and pasta. D. Ventura Peña do Lobo 2006 $19.99 This wine, from one of the two the Sil River vineyards is 100% Mencía from vines that are over 80 years old. This dark ruby colored wine is ripe with lush fruit character balancing flinty background minerality. I will be pouring this with my Thanksgiving dinner. D. Ventura Viña Caneiro 2006 $24.99 The boldest of the D. Ventura wines, this exclusive bottling sourced from small plots of old vine Mencía grown on the steep slopes of the Sil River Valley is opulent and silky while still retaining a fresh, lively balance of flavors. Notes of cranberry and pomegranate mingle with flinty minerality. This dark and abundant wine never veers into the overly extracted or the syrupy. It maintains a fine balance of flavors with moderate alcohol content and a solid foundational structure.